I don’t think that anyone can dispute how much our local law enforcement does to keep us all comfortable in our neighborhood. Have you ever had a chance to thank them or meet an officer? Other than a passing high-five or quick handshake during an event or along a parade route – the odds might be slim. Did you know that since 2014 there’s been an opportunity each month to sit and have Coffee with a Cop? 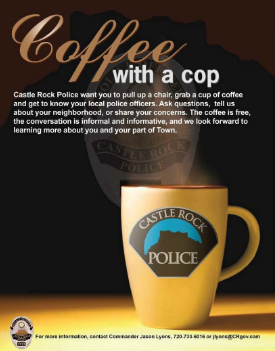 Once a month Castle Rock Police officers take time to sit-down with members of the community in a casual environment to have a conversation over a cup coffee. Each month, Castle Rock Police officers from various departments will meet with you. It’s an informal way for you to get to know the officers and for them to get to know you, too. You can ask questions in a comfortable setting that will help you understand the law enforcement process and get to know the police officers themselves. In addition, they’ll ask questions about your concerns with the community and try to understand you a little better. If you can’t make it this month, click here to learn about future dates and locations. Coffee with a Cop is an excellent opportunity to connect, learn, and better understand the people who help protect and serve our community.